'Dee Mouse' OGB+ ( Henry Danielson, R. 1983). Seedling 80-1. AB, 22" (56 cm), Early midseason bloom. Standardsruffled light blue; Falls ruffled chartreuse cream with heavy reddish brown veining covering most of Falls leaving a rim of chartreuse cream; style crest light blue like standards; large, furry black beard. (( 'Saffron Charm' x 'Jallah Ad-Din') x ( 'Imam Salah' x 'Imaret')) X 'Summer Set'. Pleasure Iris Gardens, 1984. Honorable Mention 1987; C. G. White Medal 1990. From AIS Bulletin #253 April 1984 Introducing DEE MOUSE (Henry Danielson) Sdlg. 80-2 (3/4 aril) 22", EM. S. pinkish tan; F. mulberry, wide black beard. The name was given to this flower because the beard resembles the soft fur of a mouse. It is not the hairy type found on most irises. It is extremely wide and pure black-widerthan the beard I have seen on any iris. Occasionally three branches plus terminal. Up to five blooms. Very pod fertile and pollen sets on tall bearded irises producing good seeds. Flower resembles a pure onco. (Tul Kerem x Summer Set) X Ib-Mac. $150.00. Pleasure Iris Gardens. 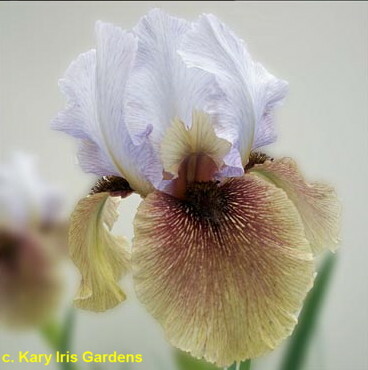 From Pleasure Iris Gardens catalog, 1984: DEE MOUSE - Sdlg, M-78-7 A,B , 3/4, 22" E,M, S. Pinkish Tan F. Mulberry, Extremely wide black beard. This beard is not the hairy type you see on other Iris, but a smooth fur type, like the fur on a field mouse, Very wide and long. I am using this flower for breeding on both arilbreds and tall bearded to produce this type of beard. Two are being introduced this year. Its mother was Best Seedling in Albuquerque, NM in 1970, H.M. 1977. At times it has two branches and terminals and up to four flowers. This is unusual for a 3/4 breed. Extremely fertile on both arilbreds and tall bearded as a pollen parent, and as a pod parent of arilbreds. I have not checked tall bearded pollen on it. (Saffron Charm x Jallah-Ad-Din) x (Imam Salah x lmaret) x Summer-Set. $150.00.